Nokia 8.1 Vs 7.1 - Which is the better Smartphone? 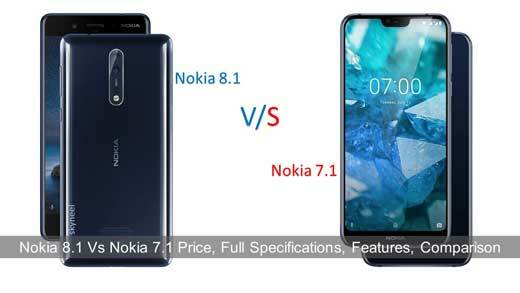 Nokia 8.1 Vs 7.1 – Which is the better Smartphone? HMD Global has launched expensive range of Nokia handsets with the name of Nokia 7.1 in India. It is available for sale on December 7 , priced at Rs 19,999. While Nokia 8.1 comes with interesting space-saving features can be included in the latest Android 8.1 update. Such features will be included for filling the low end of the Android Oreo 8.1. So that you never get any problems with the space. The Nokia 8.1 smartphone comes with 6.18 inch smartphone with 1080×2246 pixels resolution. This smartphone is powered by Qualcomm Octa-core Snapdragon 710 10nm SoC paired with Adreno 616 GPU which comes in two variants. Nokia 8.1 will comes in 64/128 GB, 4/6 GB RAM internal storage memory. You can easily expanded storage space up to 400GB with the help of microSD card. Nokia 8.1 smartphone is priced above Rs. 20,000 and it running on Android 9.0 pie operating system. This smartphone comes with 3500mAh non removable Li-Ion battery. The Nokia 7.1 comes with 5.84 inch smartphone with 1080×2280 pixels resolution and Corning Gorilla Glass 3. This smartphone is powered by 1.8GHz octo-core Qualcomm snapdragon 636 processor which comes with 3GB/4GB high speed RAM and 32GB/64GB internal storage memory. You can easily expanded storage memory up to 400GB via microSD card. The Nokia 7.1 smartphone priced at Rs. 19,999 only. If we talk about the camera quality of Nokia 8.1, this smartphone comes with 12-megapixel rear camera. This smartphone comes with 1/2.55″ Sony IMX363 sensor, f/1.8 aperture, dual-tone LED flash, 1.4μm pixels, OIS. This smartphone comes with 13-megapixel secondary rear camera with f/2.2 aperture while at the front. 20-megapixel camera comes with f/2.0 aperture, Zeiss optics, dual-LED dual-tone flash, panorama, HDR. The dimension of this smartphone measured in 154.8×75.76×7.97mm with 178g weight. Nokia 7.1 runs on Android 9.0 Pie operating system with 3060mAh non removable battery. It has Front/back glass, aluminum frame body with high quality sound feature. If we talk about the camera, this smartphone comes with 12 MP+5 MP dual sensor rear camera with ZEISS Optics and 8MP front shooter camera for taking selfies with 2x optical zoom. The dimension of this smartphone measured in 149.7×71.2x8mm with 160g weight. Nokia 8.1 smartphone comes with fingerprint scanner, Nokia OZO Stereo Audio recording, 3.5mm audio jack. It is a dual sim 4G VoLTE, Bluetooth 5, WiFi 802.11 ac, GPS + GLONASS, USB with Type-C. This smartphone comes with 3500mAh battery with fastest charging feature. The Nokia 7.1 dual sim smartphone comes with 3G, 4G with Wi-Fi, PS, Bluetooth, USB OTG, infrared feature. You can also get Ergonomic rear fingerprint sensor, compass, magnetometer, proximity, accelerator, hall, ambient light sensor and gyroscope feature. This smartphone supports Volte/4G/3G/2G on compatible networks. This smartphone is available in two colors Gloss midnight blue and gloss steel. Let’s start discussion what the main important difference between Nokia 8.1 and 7.1 Smartphone. Processor Qualcomm Octa Core Snapdragon 710 10nm SoC paired with Adreno 616 GPU, Android 9.0 (Pie) O.S., GPU Adreno 616. Octa-core Snapdragon 636 processor, 1.8GHz. Adreno 509 graphics. Memory Available in two variants 64+128 GB, 4+6 GB RAM internal storage memory. Expandable up to 400GB via microSD. 3GB/4GB RAM with 32GB/64GB internal storage. Expandable up to 400GB via microSD. Display 6.18″ IPS LCD capacitive touchscreen, 16M colors. 1080 x 2246 resolution, Corning Gorilla Glass 3 with Android 9.0 Pie, Android One. 5.84 inches IPS LCD display. 2280 x 1080 resolution with Corning Gorilla Glass 3, 432 PPI. 19:9 ratio. Dimensions Height:154.5 mm, Width: 75.76 mm, Thickness: 7.97 mm, Weight: 178 g. Height:149.7 mm, Width: 71.2 mm, Thickness: 8 mm, Weight: 160 g.
Connectivity Hybrid Dual Nano SIM/MicroSD. Supports fingerprint scanner, Nokia OZO Stereo Audio recording, 3.5mm audio jack, Dual 4G VoLTE, Bluetooth 5, WiFi 802.11 ac (2.4GHz + 5GHz), GPS + GLONASS, USB Type-C support. Nano SIM/MicroSD. Supports Wi-Fi 802.11 a/b/g/n/ac, dual-band, WiFi Direct, hotspot. Bluetooth 5.0/A2DP/EDR/LE/aptX. Volte/4G/3G/2G on compatible networks. Price & Color Priced above Rs.20,000. Color: Dark Blue, Night Red, Night Black, and Magic Night Silver. Priced at Rs.19,999. Color: Gloss midnight blue and gloss steel. Both Nokia 8.1 and 7.1 smartphone comes under expensive range handset. You can choose any one after watching the difference between them and choose best one.